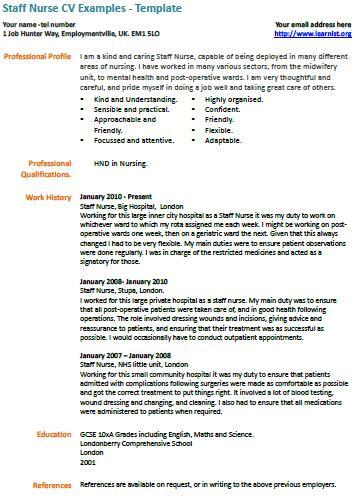 Staff Nurse CV Example – Template. Amend as suitable and start creating your own CV in minutes. You can then apply for latest online jobs. Staff Nurses job vacancies can be found on the job sites online including totaljobs, reed, cv-library and Learnist.org. You can also check out NHS careers site too. If you are required to write a covering letter for your job application then view our latest cover letter examples. Visit job forum today to ask your career related questions. I am a kind and caring Staff Nurse, capable of being deployed in many different areas of nursing. I have worked in many various sectors, from the midwifery unit, to mental health and post-operative wards. I am very thoughtful and careful, and pride myself in doing a job well and taking great care of others. Working for this large inner city hospital as a Staff Nurse it was my duty to work on whichever ward to which my rota assigned me each week. I might be working on post-operative wards one week, then on a geriatric ward the next. Given that this always changed I had to be very flexible. My main duties were to ensure patient observations were done regularly. I was in charge of the restricted medicines and acted as a signatory for those. I worked for this large private hospital as a staff nurse. My main duty was to ensure that all post-operative patients were taken care of, and in good health following operations. The role involved dressing wounds and incisions, giving advice and reassurance to patients, and ensuring that their treatment was as successful as possible. I would occasionally have to conduct outpatient appointments. Working for this small community hospital it was my duty to ensure that patients admitted with complications following surgeries were made as comfortable as possible and got the correct treatment to put things right. It involved a lot of blood testing, wound dressing and changing, and cleaning. I also had to ensure that all medications were administered to patients when required.